Last year I read and reviewed First Things First by Steven R. Covey. Although I felt Covey's concepts were great, I struggled to get through the book. 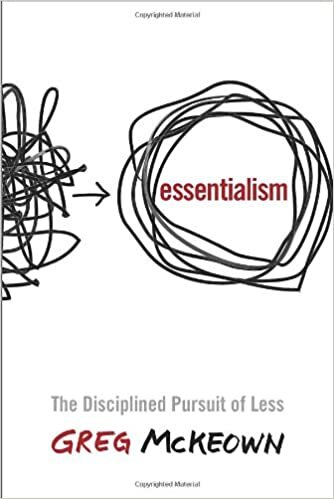 Essentialism is similar in theory, but presented in a way that is so much more delightful to read and easy to absorb. For me, reading Essentialism was life-changing. McKeown's concept is simple: Less but better. For those of us who are high achievers, we tend to take on more and more. It's what makes us stand out. It's what results in us getting promoted. But it's also what leads us to get buried. We take on so much that we can't get anything done. We're pulled in a million different directions so any progress we do make seems minuscule in the grand scheme of things. McKeown explains how this affects us psychologically. He encourages us to identify our own priorities -- "our biggest priority is to protect our ability to prioritize." And he helps us think through the obstacles that come up and how to start saying no to the things that don't help us accomplish our own goals. "If it isn't a clear yes, then it's a clear no." Above all, McKeown helps us understand that the practice of essentialism is a constant effort. It takes discipline every day to set priorities and focus on the things that are most important without getting sidetracked by other people's agendas. "The best asset we have for making a contribution to the world is ourselves."